Abstract: Across the Australian university landscape, educators are striving to internationalise the curriculum and develop students as culturally competent ‘global citizens’. There is a desire to design, implement and embed Outbound Mobility Programmes (OMPs) into the curriculum to create a more globally aware Australian workforce for the future. This project will deploy experience-based educational theory within itinerary development and seek a deeper understanding of the decision making processes of students presented with OMP opportunities. It will develop curriculum resources which maximise the probability of positive transformative experiences for participants. A mixed-methods research design incorporating case studies, interviews and surveys will produce an evidence base to enable the project to re-tool tertiary globalisation curriculum and produce technology-enriched educational resources. These materials, co-created by students and staff, will assist in leveraging students’ positive experiences to enhance recruitment, preparation and re-entry phases of OMPs. OOSH in the Bush is a new nature play program that begins delivery in September 2014 and runs till March 2015. The OOSH in the Bush is a program where 10 Vacation Care or Out of Hours School care centres will visit either Centennial Parklands in the eastern suburbs of Sydney or the Australian Botanic Gardens at Mt. Annan in the South west of Sydney for 10 hours of nature play programming led by experienced Education Rangers. The OOSH in bush program is funded by the NSW Environmental Trust and managed by Centennial Parklands. To create a significant and meaningful connection between children from 10 OOSH Centres with a wild place inspiring confidence, curiosity and a sense of care for the animals and plants within it. Overcome “nature deprivation” by re-engaging children, through play-based experiences, with the outdoors, animals, plants, weather and exploration and observation of changing natural environments to create increased environmental awareness, empathy and action, ultimately encouraging future environmental stewardship. The role UWS will play is to provide an evaluation of the first intake of this program, seeking to understand its impact and effectiveness. The report at the end of the evaluation will provide feedback to staff and managers about the strengths and limitations and ways to build and further enhance the potential of the program. time spent playing in nature is beneficial to children aged 5 -12 years in terms of health and well being,care and empathy for the natural world and each other there are barriers to getting children in school age care in playing in nature. Are High Performing, Biophilic Site Offices Linked to High Performing Workers? “Study Nature, love nature, stay close to nature. It will never fail you”. The positive effects of nature, especially plants, upon human wellbeing has been well researched and documented. Data abounds outlining the benefits of human-nature contact including: stress reduction, healing, attention restoration, development of perceptual and expressive skills, cognitive, imaginative and social capacity. However, Elings (2006) posits that little is known about the people-plant interactions or the mechanisms behind horticultural therapy. More importantly, the evidence-based research is weak due to methodological limitations of previous studies. According to acclaimed Harvard biologist, E. O. Wilson (1975, 1984, 2001) we are biologically drawn to nature. In industrialised societies, we spend on average 90% of our time indoors in built environments, often in cities (Kellert, 2005 & 2012). These artificial settings seldom offer contact with nature or design based on natural principles. In contrast, biophilic design incorporates such features as indoor-outdoor connections, natural ventilation and materials, extensive natural lighting, views to the outdoors, restored landscapes, courtyards, natural landscaping, water features and interior designs that mimic shapes and forms found in nature (Kellert, 2005 & 2013). Biophilic design intends to enhance human wellbeing by fostering connections between people and nature in the modern built environment. This is a landmark study underway in Australia incorporating a mixed-methods research design to ascertain the benefits of biophilic design for workers in a site office. A bespoke site design was formulated to include open plan workspace, natural lighting, ventilation, plants, prospect and views, and use of natural office materials. Quantitative data was gathered from pre and post-test Internal Environment Questionnaire (IEQ) scores supported by qualitative data gleaned from in-depth interviews, observations and video analysis of site workers. This longitudinal study spanning over two years will track human-plant interactions in a biophilic designed space, and the concomitant cognitive, social, psychological and physical benefits for workers. Preliminary data indicates a strong positive effect from incorporating green space to ameliorate stress, enhance wellbeing, foster a collaborative work environment and sustain workplace satisfaction. Wetlands, streams and rivers are key sites for environmental action and education (Somerville and Green, 2012). In this collaborative school environmental education project 300 young students will be empowered to learn about environmental sustainability through taking action in their local area. Local primary and high schools from of the proposed local government areas – Camden, Wollondilly and Campbelltown will be partnered with to work with UWS and community and government organisations, to undertake a participatory action research study of place based wetlands. This will assist in the preparation of teachers for the introduction of sustainability as a cross-curriculum priority area (ACARA, 2012). Link: ‘Love your Lagoons’ program with UWS and WestWords — student poetry in Western Sydney resulting from the project. All teaching materials, reports and other information available on the project website. Click on this graphic to go to the User’s Guide. International student mobility, of which study abroad and exchange are an important part, is an increasingly important element in Australian universities today. Study abroad is recognised as contributing both to important generic graduate qualities such as globally–oriented citizenship, and to campus internationalisation more generally. For these reasons, exchange and other forms of study abroad are also of growing significance as part of government policy. The numbers of students undertaking study abroad through exchange, short-term international placements or study tours is growing. However, concomitant development of support for and resources to enhance appropriate learning outcomes for students participating in these programs has been neglected. Consequently, an educational and learning opportunity of critical significance for both individual students and for universities is not fully realised. The Bringing the Learning Home project sought to enhance the value of the study abroad and exchange experience for Australian students by creating and disseminating learning and teaching materials framed around appropriately structured and conceptualised learning outcomes. The project focused on the learning opportunities for Australian students inherent in the three different phases in the study abroad and exchange experience, namely pre-departure, in-country and re-entry. The project team also analysed the demographic and cultural profile of Australian students undertaking exchange. The project team sought to generate learning outcomes for the exchange process and to support the attainment of these outcomes. Based on these learning goals, the team produced learning and teaching materials appropriate to Australian students which could be adapted for presentation on all Australian campuses. The team especially sought to integrate student reflection on their learning experiences into refining project goals and producing appropriate teaching and learning materials. The Student Trajectory Aspiration Research (STAR) project was a partnership between the Blacktown Learning Community and the Centre for Educational Research, University of Western Sydney. It was funded by the Higher Education Participation Program, a scheme initiated in Australia by the Commonwealth Government in 2010 in response to the Bradley Review of Higher Education which found that particular groups of people – Indigenous people, people of low socio-economic status and people from regional and remote areas – continue to be under-represented in Australian tertiary education (Bradley, Noonan, Nugent & Scales, 2008). The STAR project provided an opportunity for the development of a collaborative model for university–school partnerships in relation to supporting the development of appropriate career and further education aspirations for all children. The creative methods trialed in this study provided important information about the significance of opportunities for teachers and students to imagine possible futures at all levels of schooling. For low SES students this is particularly important in primary schools, where early differentiation in career choices becomes strongly established. Rather than supporting the idea of early fixed career choice, the findings of this study suggest that children need to understand the multiple pathways to career choice and the factors that will assist their success. 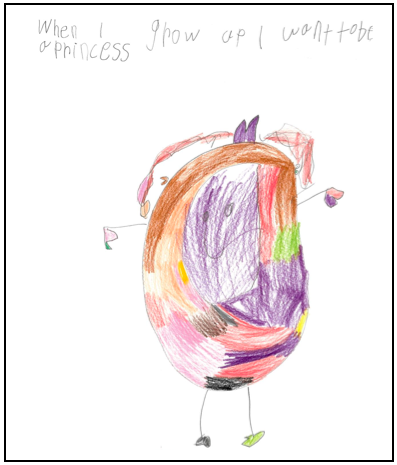 By Year 5 children have sophisticated ideas about their choice of careers but little information about the multiple pathways to achieving their career aspirations. The lack of specific insights about participation in university education is apparent at all levels. By Year 8 children are seriously concerned about their educational achievement and lack of fixed career goals, when it might be more effective to develop passionate engagement with learning as an opening to future possibilities. The findings suggest that socio-economic and gendered limitations on career and further education aspirations become more entrenched as students progress through secondary education, when it might be reasonable to expect that school education should be able to mitigate against these outcomes. ‘Touched By The Earth’ (TBTE) is a learning enrichment program for Bomaderry High School year 7 and 8 gifted and talented students, conducted during the 2012 school year. 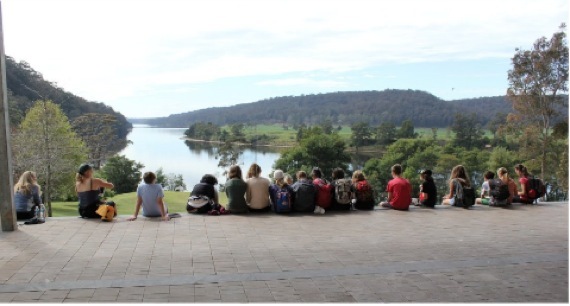 This pilot program, informed by the rich environmental, historical and cultural heritage of Bundanon Trust, involved cross-curriculum studies and research in geography, history and science enabled through the arts. Bundanon Trust aims to develop this pilot program as a regular offering of the Trust’s education programs, normally focusing on the visual arts. The program extended over the four school terms. Integral to the program was the opportunity for students to be involved with artists and scientists connected with Bundanon Trust’s SITEWORKS and artists in residence program. This report draws on research from education, recreation, leisure, tourism, sport, adult learning, health, and therapy to highlight the evidence of the positive contributions of outdoor adventure activities. The authors acknowledge the combined effects of difficulties encountered when measuring experiences and benefits with the paucity of Australian and New Zealand research in this area. This has meant a broad sweep of the available research to include both qualitative and quantitative studies, theoretical papers, and reports from complimentary disciplines and other countries. The evidence-based research reported on here used a variety of methods including meta-analyses, questionnaires (mostly utilising psychometric questioning e.g. Life Effectiveness Questionnaire – LEQ), and in-depth interviews and were either cross-sectional or longitudinal in design.